I often talk about the way the little things we do every day add up to big savings. And there’s no better demonstration of that fact than in your kitchen. When we buy good food at a good price and use it wisely, we will save a lot of money. If we overbuy overpriced junk and then let it rot in our pantries and fridges, we’ll end up throwing away our money. Americans waste approximately $360 worth of food each year, and I’m reminded of this fact whenever I clean out my pantry or defrost my freezer. It’s a terrible feeling to know you’re wasting resources and money by throwing away food you forgot to eat before it went bad. In my year of living greener, I began to get better about not wasting food. I began to compost more food waste and save up scraps for making soups. I worked harder at sticking to buying only what I needed and using it up before it went bad. I tried to make sure I ate the leftovers, even if I wasn’t thrilled about them. But I’m still far from perfect. That’s why I was excited when a friend of mine gave me her copy of Waste-Free Kitchen Handbook by Dana Gunders. 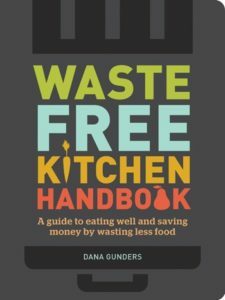 In Waste-Free Kitchen Handbook: A Guide to Eating Well and Saving Money By Wasting Less Food , National Resources Defense Council Scientist Dana Gunders explains why food waste is a global issue and outlines simple ways to prevent it. She also dispels the illusion that addressing food waste issues takes a ton of time and money as she shows you how to shop smarter, portion more accurately and store food properly. What I like about this book is that it covers so many money-saving aspects of food – meal planning, shopping for food, sticking to portion sizes, and proper food storage. There are tips for canning, drying and freezing foods. There are tips for planning food for parties so that less food (and money) goes to waste. 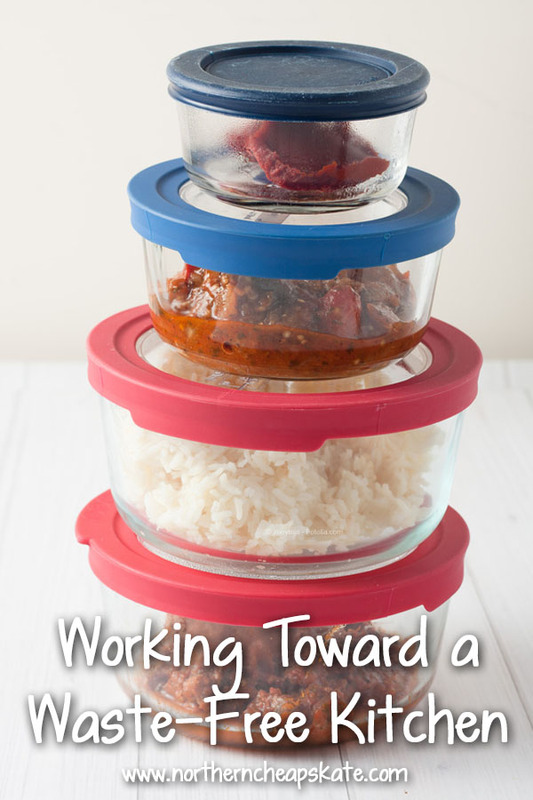 Gunders also shares how to store food in your fridge and pantry in order to make sure it’s eaten. This colorful book has menu plans for you to fill out as well as a worksheet to log what food you’ve wasted each week so that you can make a plan to address the problem. She touches on whether we should eat or toss certain items. And she offers guidelines for what to do with food scraps, like composting or feeding them to animals. The most useful parts of Waste-Free Kitchen Handbook are the recipes for using up those last little bits of food and an index that clearly explains the proper way to store and preserve foods for your pantry and freezer to optimize their shelf life. Gunders does a great job of educating the reader on food waste without shaming them. She recognizes that none of us is perfect when it comes to this issue, but with just a little bit of effort, we can all waste less food. And less wasted food means more money in our pockets.